The probate process can be frustrating and confusing, especially if you’re the will's executor. Even if the deceased had their own lawyer, you can always hire a different one to help you through the probate process. At the offices of Glasgow, Isham, & Glasgow, P.C., you’ll find a versatile team of attorneys ready to represent you with over 40 years of experience in several major areas of law. For help with the probate process, you’re in good hands. Here are a few tips from the experts to help you find the right attorney for your case. Most people start their search for a probate attorney online. Search engines like Google, Bing, and the Better Business Bureau will probably provide you with several law offices and attorneys in your area. How to determine which one is right for you? Start by checking out online reviews. The BBB uses an unbiased rating system based on client experiences. Negative reviews can’t be erased, but companies can reach out to the client to try and fix their concerns using a transparent third-party platform. 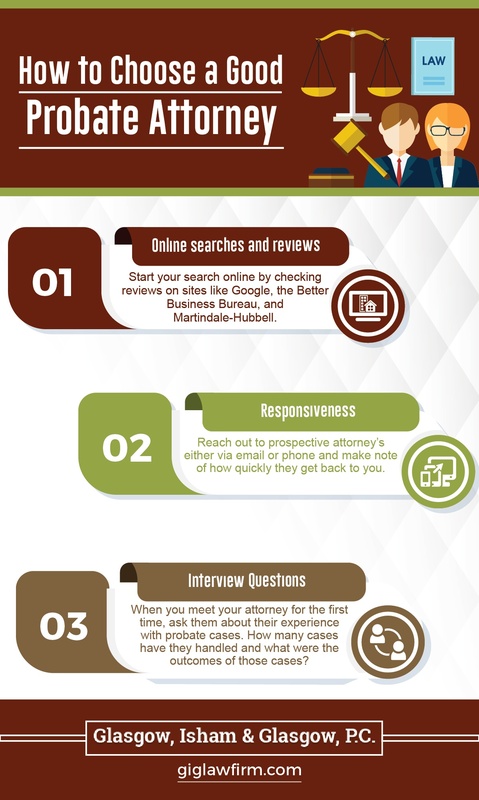 Another good site to check for attorney reviews is Martindale-Hubbell. On Martindale, attorneys are rated by their peers based on several factors like courtroom presence, competency, and legal knowledge. As you narrow down your list of potential probate attorneys, call or email a few of the names or firms on your list. Make note of how quickly they respond. If you’re calling after normal business hours or on the weekend, do you get a voicemail or an actual person? How quickly do they respond to email or voice messages? A quick turn-around time on inquiries is usually an indication of the company’s responsiveness to client needs. This will give you considerable peace of mind when you need information or advice fast. Before making your final decision, schedule a sit down with your prospective attorney. Ask them about other probates cases they’ve handled and the outcomes of those cases. How do they charge for their services--by the hour or with a flat rate? Will they help you prepare important tax documents for the deceased and their estate? How long do they think the process will take? This question is especially important because it helps you determine how your attorney will prioritize your case. Before signing the dotted line for any services, ask for and verify their education credentials and the firm’s business license.